Take a look at your salary slip. If you are getting RM8,000 now, when is the time you will get RM16,000 per month? Now, check your investment portfolio. How soon can you double the amount? Is it possible to pull it off in 6 months? Three years? Ten years perhaps? If you divide the world population into two groups, the first group consists of those who can double their money fast, which is the minority. The second group is the majority of the middle class and the poor, who either don’t think it is possible or don’t know how they can make it. Most people believe that you can double your money only if you get lucky in a lottery. Of course, we have all seen those instant millionaires and see how easy it had been for them to win that jackpot money. It hardly required any effort on their part – it was pure luck. That was it. 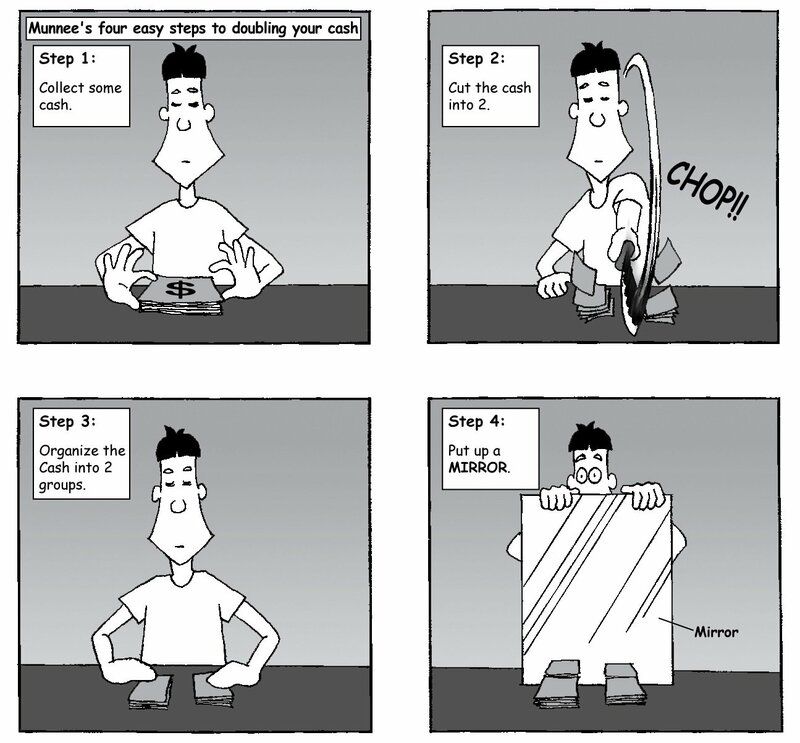 Alternatively, you can also try doing what Munnee did on the comic strip: literally, chop your paper money into two, divide them into two groups, and then place a mirror beside them. Double your money in a flash! If luck is what you wish for, it might never come. Luck only comes to those who prepare. I believe you will like to see that happens (doubling your money). The question is: When? How soon? How fast? For super-investors like Warren Buffett, he consistently doubles his wealth every 4-6 years. For genius entrepreneurs like Bill Gates, Elon Musk and Mark Zuckerberg, it is about 1-2 years. As a matter of comparison, if you can double your money consistently within a few short years, you are on your way to joining the multi-millionaires club. So the logical expectation is about 4-6 years for an investment to double in value. That’s about 15% annual compound return. In fact, you will be doing great still if your investment portfolio takes 7-9 years to double. Not too bad. However, if you are aiming for 10% return per month (120% per annum), without any effort, you are asking for trouble. We had heard of some magical schemes that can deliver it to you. I would stay far away from it because there is a smell of money game and Ponzi scheme. Nothing can double your passive investment consistently every few months. You need to know that! Then what kind of investment can deliver >10% return a year? Look into business (stocks) and properties. If you are striving for the 100m sprint like Usain Bolt, and can’t wait for the sure-win marathon, you need another set of skills. You need to be an entrepreneur, who can create tremendous value for the world. You need to increase your capability, keep growing and work extremely hard! Do you have what it takes? There are sacrifices. Are you willing to compromise? In my opinion, you don’t have to go through the sprinting route. A long-term marathon run is also good enough to enjoy an exciting life. How fast to double your money? It is up to you to decide. Just don’t lose it fast! 10 replies to "How Fast Can You Double Your Money?!" feeling dejected with our Bursa stocks. Foreigners keep selling share. not sure when will end. better kept in conventional banks at the moment. There is no short cut in this world ; its all about the consistency, hard but smart work , efficiency and some luck meeting the right person at the right time and right place. For those who wants easy and fast money in, as easy as money comes in as easy as money goes. 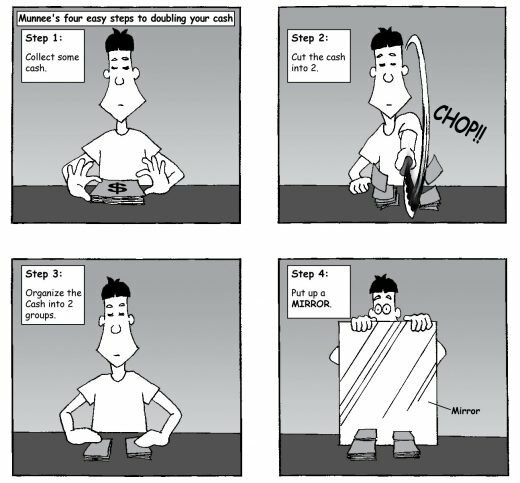 I believe it all happens with a proper planning , having a correct tool and product. Since it takes effort and time to invest in a plan therefore persistency and self discipline , perseverance is important to ensure the plan is carry out successfully. Frankly speaking, if u are earning money, u do not have time to write out such Long post or telling people HOW to make money. Kerrian, I don’t understand this comment. In investments, having passive income is the ultimate target. With multiple income streams, you will have lots of time to pursue your interest. And Mr Lau is proof that if you have clear targets, the right mind set, and the right knowhow, then you are no longer a slave to money. He clearly has a passion for teaching (most smart people do). And he uses the time he has gained to satisfy that passion. And in the process this blog makes yet another revenue stream. Win-win. So, it’s all about having a right mindset and clear objectives. It was a great tips and make my mind opens. However, in my case, it’s hard for me to invest my money (saving) especially in stocks. It always playing around in my mind that take out (withdraw) my money from bank (personal saving) and invest it to another stocks/any portfolio will make me not belongs to the money anymore unless if we withdraw the money. In a sense of belong to the stocks always make me think it’s not my money especially if implicating a lot of money. Feeling insecure and afraid to lose. No pain no gain right, easy to say but hard to apply. This is just from my opinion especially a Malaysian I guess. And might be because of the race/culture as well. Always looking for someone to share their opinion regarding the money tips like you. Thanks a lot KC Lau for all your tips previously. It’ tremendous… I really don’t know how to convince myself on doubling my money by investing like what you prefer.. hahaha… I think it’s just about mindset and need a little courage and support.. Yes, I would like to strive for a 100m sprint like Usain Bolt because I can not stand anymore with the debt even though I’ve been in the Counseling Agency(AKPK) for 4 years. I want to get out of debt that is a lot of blocking my will and family. There are a lot of business opportunities I have to add to my income but fail and have to be satisfied with my small salary every month.